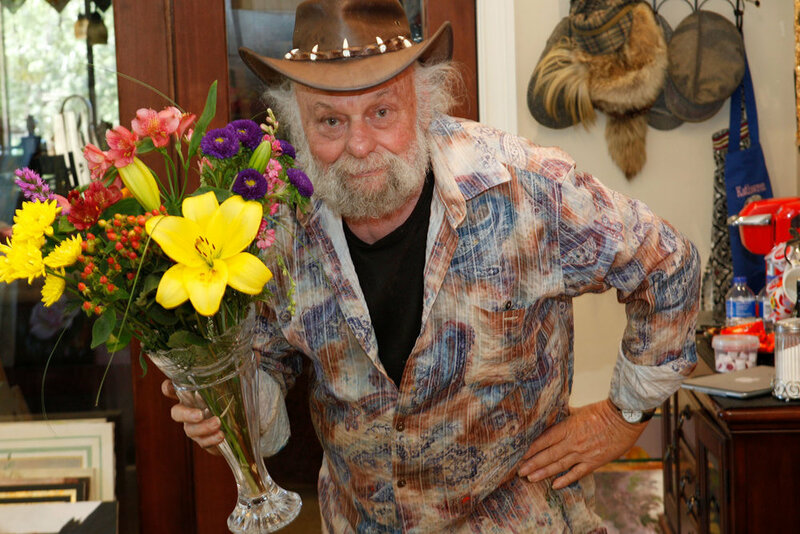 Get in touch with your creative spirit in Sedona, Arizona one of the most beautiful places on earth! Expert instruction brought to you by Gary and Kathwren Jenkins, Televisions #1 Floral Painting Artists. Learn how to Paint with Passion! 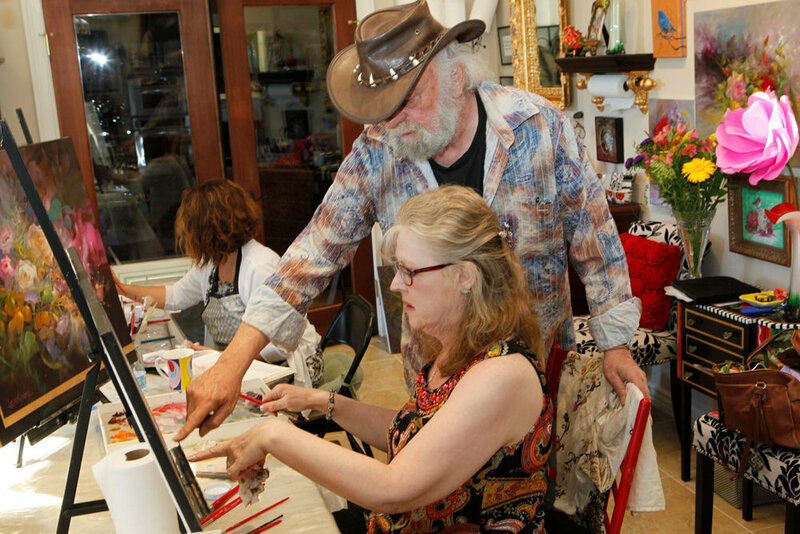 We offer semi private painting classes for all levels, that inspire artistic growth with master artists Gary & Kathwren Jenkins. You will have a unique creative experience with lots of personal attention. 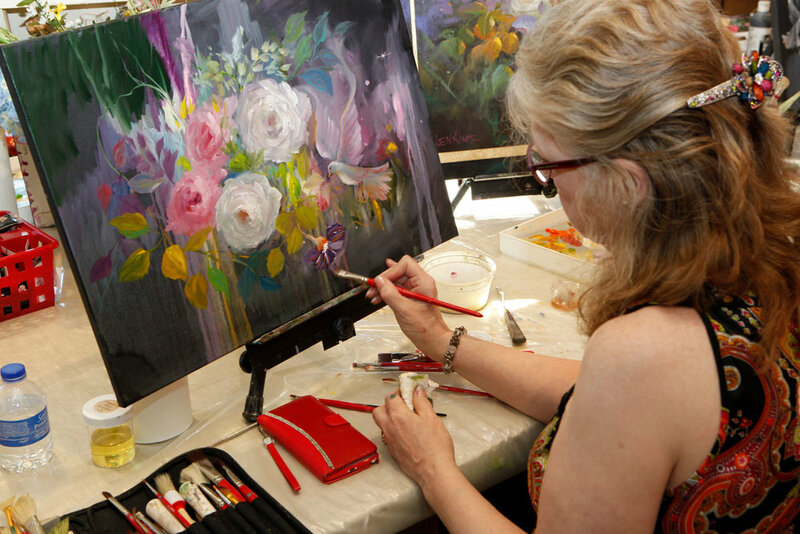 Learn how to paint, mix colors, compose your painting, and how to evaluate your finished paintings. Jenkins Art Studio is located in beautiful Sedona, Arizona a year round destination. Whether you're a beginner or experienced painter our workshops enable you to improve your painting skills quickly in a relaxed creative environment. These very special semi private seminars are held in our home/studio and are only open to 4 students per class. They are taught by Gary Jenkins and assisted by Kathwren Jenkins. All painting supplies will be included in the workshop fee with the exception of the canvas. We will special order the canvas for you, that you can purchase from us, or you may bring your own. Lunch will be provided each day at some of Sedona's finest resturants. DONT WAIT TOO LONG TO SIGN UP- SEMINARS FILL VERY FAST. To reserve a space in the 4-Day Semi Private Seminar, please call our studio ( 928) 282-2421 ) A NON- REFUNDABLE $100.00 deposit is required at the time of sign up. Visa,Master Card or Discover cards are accepted, as well as a personnel check or money order. Price for the 4-day semi private seminar is $1,200.00. Class fee includes all supplies, except canvas, which can be purchased separately at our studio, or you can bring your own. Class fee also includes lunches for all 4 days at very nice Sedona restaurants. Students who spouses or travel companions that wish to join the class for lunch, will pay separately..
Class Balances: The class balance is due IN FULL 30 days prior to the fist class day. Please be sure you contact our studio to pay your balance on time. If you need to cancel the seminar, please do so at least 30 days or more ahead of time. If you know you cannot attend the seminar please cancel as soon as possible so we have time to contact our wait list people. We only accept 4 students at a time and we need to have time to fill your space from our waiting list, so those persons have time to make their lodging and travel planes. When booking a room it is suggested that you book the room in West Sedona. This is the area closest to the Jenkins Art Studio where the classes are held. NOTE; Be sure to book your lodging several months in advance ,as our lodging fills up several months in advanced during our busiest tourists seasons of Spring and Fall.Most places will accept cancellations without a charge. Some of the most reasonably priced motels/lodges in Sedona. www.Visit sedona.com your resource for every thing Sedona. Lodging, food, entertainment, tours, spas, climate, general info, interesting articles and photos of sedona. www.Sedonabest.com Also, a very good website for Sedona information. Students will fly into the Phoenix Sky Harbor Airport. A shuttle service is available from the airport to Sedona. Ace is the shuttle service we recommend. There are also many car rental companies available at the airport. There is also Enterprise and Hertz rental car companies in Sedona. It is an easy 2-hour drive north from the Phoenix airport to Sedona. Note: if you rent a car in Sedona, be sure to book ahead. Enterprise and Hertz in sedona are small and they do not have many cars available. If students are flying to the seminar and need to ship their seminar paintings home, there is a pack and ship store near by and is open week days and on Saturday mornings after the seminars. There is also a Staples that ships paintings, open 7 days a week, and a UPS Store open on week days. We will be happy to help you put your wet canvases together for shipping at the end of the seminar HOWEVER IT IS YOUR RESPONSIBILITY TO DELIVER YOUR PAINTINGS TO THE SHIPPER. Class times, studio address: Please arrive at our studio by 8:30 am the first morning.Address: 320 Ross Rd. Sedona AZ. 86336 Class hours are from 8:30-4:30 each day with 1 &1/2 hour for lunch. or call (928 ) 282-2421.